Here is the collection of other paintings I have done over the years. No real series, just images or ideas I wanted to pursue. South of Mont Rigaud near Montreal, the terrain is pancake flat. Based on a photo, I wanted to capture the feeling of summer light and space. 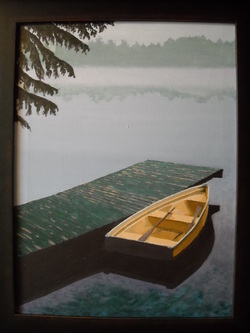 As the Dying Elm below, also inspired by the same location, I used lots of different products to enhance the paint. So it is thick in some places, such as the nearest rows in the field. The stream is glossy and the sky matte. Although I started on it several years ago, I always had something else to work on. But I did keep coming back to it and am happy with the result. Acrylic on canvas. Size: two feet by four feet. Not for sale. In fall 2014, I saw the Alex Colville exhibit at the AGO. A painting there of a skater stuck in my mind, but not in a good way. I thought that nobody actually skates like that. 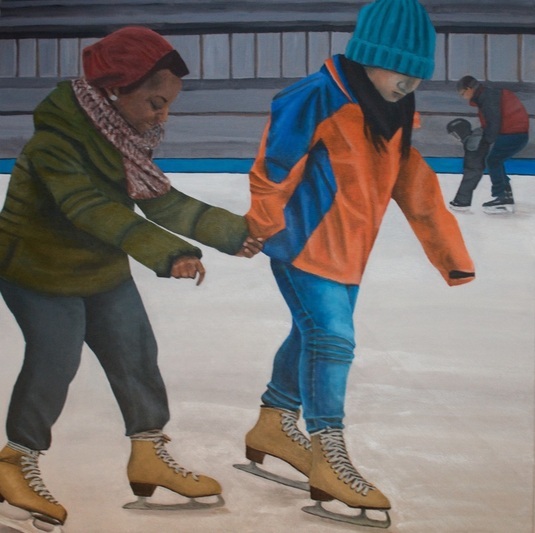 That idea stuck with me and in December 2014, I decided I wanted to paint people skating. So I went to Nathan Phillips Square and took some photos. The gesture of these two young women drew me immediately. They are connected, yet disconnected. Along with the father and son in the background, this is what learning to skate is all about, the reliance on another, and yet engrossed in your own world. This is one of the larger paintings I have done and I did enjoy it from start to finish, which is rare. The two young women moved a lot in the process of painting as I struggled to get them to feel right for me. So it was a lot more work than usual and if anything, they grew larger as time went on. I did not mean to run them off the canvas, but I'm happy they did. Overall, it was four months of work, but I believe I caught the mood I was seeking. Acrylic on canvas. Size: four feet by four feet. One day, I had the urge to get a map and paint on it. I had seen something and ran out to a second hand bookstore where I bought several maps of Toronto. I had been taking photos of the building cranes all over Toronto at this time as well. The way condos are reshaping Toronto is something that fascinates and at times bothers me - and we are reminded of it every day in almost every part of town. This map dates from 1960 and I wanted to work in the map into the image of a crane. After months of slow effort and some changes in direction, I have some up with something that speaks to me of the sky above Toronto while also connecting with the changes on the ground over time. I love the idea of using a vintage map and hope to find some more that inspire me. Acrylic on vintage map. Size: 22 by 29 inches - sold. This painting started years ago in class. Every week we were running through different techniques. One week it was mounting paper on canvas and then painting on it. I had found a beautiful red-purple paper with gold foil. I mounted it - and then no idea came of what to do with it - for years. Finally, I decided on a lotus flower because I wanted something that was purple to sit on the paper. Months more to draw and then paint with thin paint glazes to build up colour on a white background. I like the intense light at the centre and the feeling of the flower sitting in space. Acrylic on paper mounted on canvas. Not for sale. In 2012, I was cycling near Mt. Rigaud, Quebec, and off in the distance I could see dark thunderstorm clouds (never a good sign for a road cyclist) and across the field, an elm tree starting to die. This foreground image was brightly illuminated by the summer sun - the storm clouds had not covered the sky yet. It struck me and I stopped to photograph the scene. I don't consider myself a landscape painter but I am growing into it when I feel there is a way to work the painting's surface in different ways to give it texture and vibrancy. So in this case the leaves are quite shiny and thick. Likewise the trunk - although not shiny. The field in the foreground is actually worked even more thickly, coming out about progressively on top of the canvas at the bottom to about an inch higher. But it all comes back to a single dramatic visual moment that stayed with me and that I knew I wanted to capture. Acrylic on canvas. Size: two feet by four feet. Not for sale. St. George Subway Between 8:20-8:30 a.m.
Look closely… The canvas is covered in St. George subway transfers between 8:20 and 8:30 a.m. (most easily seen on the stairs) I collected them while taking the subway to go to work in 2010-2012. Working from a photo I took on my cell phone, I came up with this painting to try to capture the incredible anonymous bustle of rush hour on public transit. I worked with very thin layers of paint to try to allow the transfers to show wherever possible and to keep the overall feeling rough and of blurry movement. Acrylic on Toronto Transit Corporation subway transfers on canvas. Size: 30 by 40 inches. This painting has a long history. I started the background with no idea of what I was going to do, I just glued tissue and other papers down. Then, I discovered comic books! Bookstores have big sections of them, they are cheap and their storytelling is familiar to all of us, at very least through movies based on them. So I bought a comic book based on the cover image and there was Jessica, on page after page, staring defiantly at her kidnappers. Next came the idea from my collage professor, Donnely Smallwood, to include a portrait of her as the central theme. There see is, with many other images of her pushed back or very far back through further layering with tracing paper. Multimedia on canvas. Size: 16 by 20 inches. It has been years since I have done a 'landscape'. I am more interested by urban-scapes. But in June 2012, I went for a meeting at the Toronto Hunt Club. I never imagined such an oasis of nature and beauty existed by the lake in Scarborough. The sky was incredibly blue as only happens before the haziness of summer sets in. I would have never thought we were actually in the city. As you can imagine, looking out over the lake from the meeting room, I was very distracted that day. The view was fascinating as we were at a golf course and located on the Scarborough Bluffs - so no view of the actual shore. I decided that this would be an exercise in using as many products as possible to push the paint in different directions. The sky is painted on a product that makes the canvas act more like watercolour paper - so lots of layers there. The lake is paint with a product that makes it thick and shiny. And the grass - two tone to represent the regular grass and golf green - is full of products that make it thick and substantial. Who knows, maybe I enjoyed this enough to do some more 'regular' landscapes. Acrylic on canvas. Size: 12 by 48 inches. Not for sale. This is the most personal of my paintings. My mother 'commissioned' a painting for her living room wall. I had this photo for years of a vacation cottage my parents had taken north of Montreal. After a rainstorm, they encouraged me to go and take some photos that I had always kept. I thought this would be an image with meaning for all of us. After it was finished and hung, I looked at the date and it was the last summer of my father's life, he died a few months later. Acrylic on canvas. Not for sale. My fascination with masks led to painting them, not simply drawing them. My sister-in-law was bugging me for a painting and had been asking me for a painting and was disappointed when the first version of this was sold. So I painted it again, just larger. Nobody has ever been happier to receive one of my paintings! The image holds my gaze because of the colours, expressions and story that you can fill in. Acrylic on canvas. Not for sale. Years ago, I photographed people on Spadina without them knowing. This was the best image and I loved this woman's expression. Once I started needing painting subjects, I came to this one and I interpreted it, perhaps more than I wanted but that's what happened. I can see how images like these that isolate people or objects are a frequent subject matter. Acrylic on canvas. Size: two feet by three feet.